呸 PLAY, 4th week: Jolin ranks #2 on 5music and #3 on G-Music! WATCH JOLIN'S 呸 PLAY CONCERT! 呸 play, 2nd week: jolin ranks #1 on g-music & 5music! 呸 play, 5th week: jolin still #2 on 5music & #3 on g-music! 呸 play, 6th week: jolin ranks #4 on 5music and #1 on g-music! 呸 play, 7th week: jolin ranks #10 on 5music and #11 on g-music! 呸 play, 8th week: jolin ranks #9 on 5music and #7 on g-music! 呸 play, 9th week: jolin ranks #13 on 5music and #17 on g-music! 呸 play, 10th week: jolin ranks #16 on 5music & #8 on g-music! 呸 play 11th week: jolin ranks #14 on 5music and #11 on g-music! 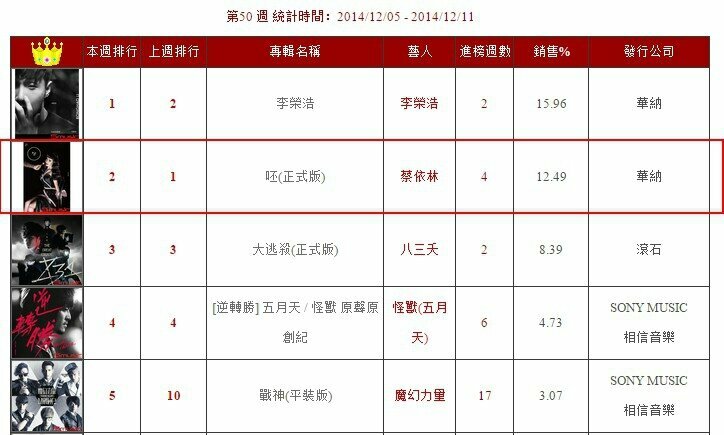 Comments on 呸 PLAY, 4th week: Jolin ranks #2 on 5music and #3 on G-Music!